This is a compact miniature chessmen set that shows the elegance and beauty of the Roman Empire. The chess pieces of this set are made from a ground stone material composite that has all the characteristics of stone but the durability of plastic. The King of this set represents Julius Cesar, with his traditional toga dress and many other important characters of this fabulous and historical era. The king of this set measures 3". Bring your imagination to reality with this beautiful Elven Figurine Chessmen Set. They are made of durable Polystone Resin. The King is 3 1/2 inches tall. The base is 1 inch. 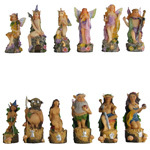 The magical world is represented in these polystone Fantasy Chess pieces. By the best artisan they beautifully and skillfully convey the true significance of a fantasy land world. The King is 3 inches with a 7/8 inch base diameter. Bring your imagination to life with this skeleton figurine chessmen set. Each piece is crafted from polystone resin and individually painted in extremely meticulous detail. The King is 3 1/4 inches tall with a 1 inch base. P220-MILC. Mini Isle of Lewis Chessmen. The pieces of this set are the miniature imitation of the original pieces that were discovered on the Isle of Lewis off the West Coast of Scotland and are now safely displayed in the British Museum of London and in Edinburgh. Many pieces were discovered, this particular style was featured in the movie, Harry Potter and the Sorcerer’s Stone. The king of this set measures 2.25 inches. P102-BE-A102. 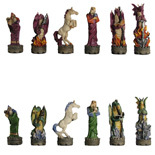 Collector's Edition Isle of Lewis (Harry Potter) Chess Pieces. P219-RILC. The Red Isle of Lewis Chess Men. These chess pieces are imitation of the original pieces that were discovered on the Isle of Lewis off the West Coast of Scotland and which are now safely displayed in the famous British Museum of London and in Edinburgh. These Isle of Lewis chessmen were featured in the memorable movie, Harry Potter and the Sorcerer's Stone. The King measures 3.75 inches. P201-AEG. Egyptian Gods Polyresin Chessmen Pieces. The Ancient Egyptian Pharaohs and their sacred gods are well represented in this handsome and impressive chessmen set. The pieces in this set are hand crafted from durable polyresin stone with an opposing army featured in stained rich burgundy brown. The king measures 4.72 inches. P104-219. Huszar Hungarian Solid Maple Chess Pieces. 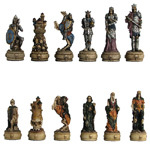 These wonderful chess pieces are a must for the true collector. Each piece represents a character from the much loved Huszar. These solid maple chess pieces are then carefully hand painted by the craftsmen in Hungary. The King is 4-1/4"inches tall with a 1-1/8" diameter. This set represents the memorable and wonderful Greek Ancient Mythology Gods. This is our most popular chess pieces set, often used as background decoration for many popular TV shows and movies. 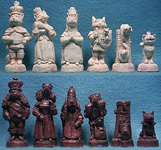 Chessmen in this set are intricately made from antiqued ground stone.The king of this set measures 7 1/2 inches. P203.SH. Sherlock Holmes Chessmen Pieces. These incredibly chess pieces depicts the world's most famous detective Sherlock Holmes. The set includes characters such as Professor Moriarty, Doctor Watson, Mrs. Hudson, Inspector Lestrade, Irene Alder and Colonel Moran. The pieces from this set are hand crafted from durable polyresin stone. The king measures 4.92 inches. This magnificently themed chess set features 32 handsome crushed stone cats and dog themed chessmen intricately made out of durable polystone resin. Polystone is a resin that is combined with powder stone which gives the chess pieces the added weight and porcelain or stone like look and feel. This set is a collectible item designed with dog and cats lovers in mind for everyone to enjoy at a very affordable price! The king measures 4 ½” with a 1-1/2” base. P017-ITP179MW. Camelot Brass Wood Chess Pieces. These Italian designed Brass Wood Staunton chess pieces represent King Arthur and the days of Camelot. The hand made brass chess pieces sit atop brown and natural finished wood. The king is 3 1/2 inches tall with a 1.3 inch base. P205-LRH. Lord of The Rings, Hanpainted Chess Pieces. 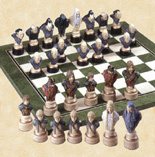 The Lord of The Rings created by J.R.R Tolkien is represented in this highly detailed chess pieces set. The set includes all the main characters from this epic storyline made out of polyresin stone hand painted and hand crafted by the best England artisans at the Anne Carlton studio. The chessboard of this set is used for display purposes only. The price includes only chess pieces.The king measures 4 1/2" tall. P202-SH. Sherlock Holmes Polyresin Hand Painted Chessmen Set. This handsome set depicts the memorable fiction character of Sherlock Holmes. This set is hand painted and made from polyresin, which is a composite material made from crushed stone that has all the characteristics of stone but the durability of plastic. A great set that will deliver hours of fun for many generations! The king measures 4.92 inches. P103-368. Oxo Teak Hand Painted European Animal Kingdom Chess Pieces. Based on the favorite animals characters of the animal kingdom, these oxo teak chess pieces are highly collectible. The Lion, the Gorilla, and the zebra are all represented in these Italian hand painted pieces . The King is 4 3/8 inches tall with a base diameter of 1- 9/16 inches. P106-320. Oxo Teak, Cleopatra Hand Painted Chess Pieces. The best Italian Artisans created this beautiful collector's edition chess pieces that celebrate ancient times of Cleopatra the Queen of The Nile. These hand painted Chess pieces attractively illustrate Cleopatra and many other characters from the Egyptian dinasty. The pieces are hand decorated and crafted of pure oxo teak. The King is 4 1/2 inches tall with a 1- 5/8 inch base.